Skinfix is a wonderful company targeted at fixing skin. They use natural, gentle ingredients to really help target problem areas of your skin and fix them. They are a Canadian based company and they are accepted in the National Eczema Association! First of all, I love the the kids stuff is a different color from adults. Makes it easy to decipher who its for without having to read. For adults I received the Body Repair Balm, Daily Lotion, Cleansing Oil Wash, and the Hand Repair Balm. For the kids I got the Kids Eczema Balm, Gentle Body Wash, Gentle Lotion and Gentle Eczema Balm. The Gentle Eczema Balm is meant for babies 0-3yr and the Kids Eczema Balm is meant for older children 4yr +. All of the items are unscented so they are definitely mild for your skin. A lot of eczema is caused by products used and a lot of products contain fragrances and dyes. But Skinfix doesn't contain any of that fake junk so it's better for your skin and will help it heal. I've been using the Hand Repair Balm almost every day. My hands are not super dry, but my cuticles are terrible and this has really been helping. I've also used the cleansing oil wash. It is nice and gentle and lathers really great, but I do prefer a little scent on my body! I haven't had an eczema flare up since receiving my products so I haven't used the other products yet. My eczema is mild however and I usually only flare up a couple times a year. My kids have been using all the above products though. My almost 8 year old likes the kids eczema balm and a little goes a long way with that product, it spreads really well, so don't be intimidated by the small size. My younger boys have been using the gentle body wash and it seems to really be helping them. My 3 year old had a really bad flare up on his lower back and this in combination with the Gentle Eczema Balm has been really helping him. I'm glad I know I have these products on hand for when my kids have bad flare ups. Skinfix are available at Target! I didn't know this before seeing it on their shelves and I was excited to see it in stores! Price: Most of the products are $18-$20, but I truly think it's worth it. They go a long way and will last a long time. 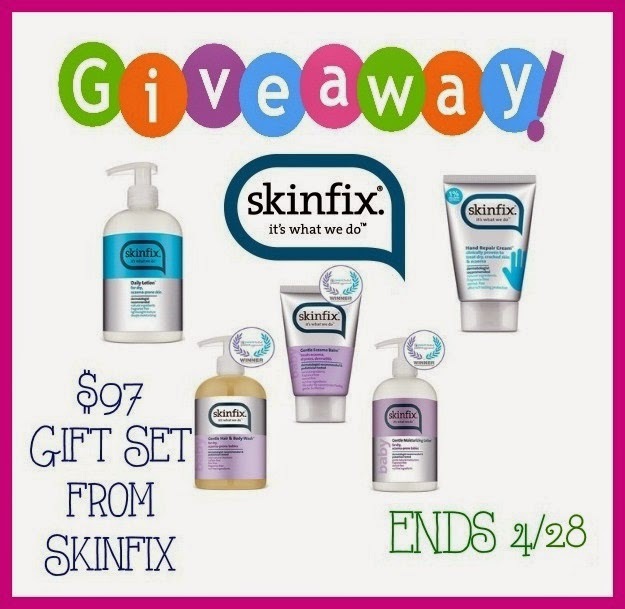 And now you have a chance to win a $97 gift set from SkinFix!! One Winner will receive the Kids Daily Lotion, Wash, and Eczema Balm and the Adult Daily Lotion and Hand Repair Cream. So Easy Being Green, Viva Veltoro, and the Spring Sweeping participating bloggers are not responsible for sponsors who do not fulfill prize obligations. The hand repair creme looks wonderful. I'd love to try the Diaper Rash Balm! I love that they have such a huge selection of different products for different uses. You're sure to find something for everyone in the family. I would also like to try the Hand Repair cream. I like the ingredients in the products like beeswax and coconut oil. I would most look forward to trying the hand cream. Fingers Crossed, Great, Awesome Giveaway. Skinfix is the BEST. I love the hand repair cream. I would love to win this! Thanks! Another item I'd like to try is the Skinfix Healing Foot & Leg Balm. I learned that their remedies for skin problems are derived from a century old family recipe. I'd love to use the body repair balm. I learned some of their products are sold only at Target. I like the GENTLE ECZEMA BALM. I have eczema and this would be a great product for me. I am excited to know it exists. I'd like to try is the Skinfix Healing Foot & Leg Balm.I would also like to try the Hand Repair cream. I would love to try the Gentle Eczema Balm to see if it would help. I learned that they believe in healthy skin. I learned the formula is from a century old family recipe. I like that they're made from natural ingredients. I learned that Skinfix healing balms are “anhydrous” and contain no water in the formulas and therefore have no risk of growing bacteria or mold. I would like to try the Healing Foot & Leg Balm. It's great to know that it quickly prevents and soothes skin problems like eczema, diaper rash, chafing and cracked skin caused by poor circulation! I'd like to try the Cleansing Oil Wash on dd to see if it helps with her dermatitis! They have products that are not only for your skin like their Gentle Hair & Body Wash. I like the ingredients are mostly natural and pure. I love that they focus on healing with natural ingredients!! I also like that you choose a specific condition to focus on! Our remedies were born from a century old family recipe, passed down from British Pharmacopoeiao. I learned: If you have irritated skin avoid Cooling Ingredients – Menthol, Camphor, Mint, Wintergreen & Peppermint. I'd love to try the diaper balm. I love the natural list of ingredients that they use. I learned that the Skinfix products use their own unique combo of vitamins, minerals emollient oils and other ingredients that help restore the lipids and protect the skin so it can begin to heal. I was also impressed that Skinfix does not use any fragrance and best of all no steroids. I also thought it was Incredible that this company wasn’t worried as much as selling their product they really want to help people get the right skin care they need. Having bad skin is embracing and it does affect how you feel about yourself. I would love to get my skin in good condition and I believe Skinfix that healthy skin can lift your spirits. This product sounds perfect for me and I hope I get the chance to try it. I like that this helps with eczema. This would be great for my son. I learned that up to 30% of kids are affected by eczema! I had no idea it was that much. My youngest has mild eczema, but it gets bad if we don't moisturize her completely. These products look great! I learned they are a Canadian company, don't use steroids in their products nor do they water them down. I like that they are a Canadian company and the hand repair cream sounds like something I could really use. I also love the Gentle Eczema Balm for babies! Ohh! I'm really interested in their Daily Lotion! I need a new moisturizer! I learned their products contain no salicylic acids. That is important to me. I'd like to try the Gentle Eczema Balm as well. I would also love to try the Healing Foot & Leg Balm! I learned they have a cruelty free seal. I like the Cleansing Oil Wash. I learned that the Skinfix formula was created over 150 years ago. I like the cleansing oil wash. It would be great for my dry skin! I would like to try the Skinfix Healing Foot & Leg Balm. I would love to try the hand repair cream. I learned that their remedies were born from a century old family recipe, passed down from British Pharmacopoeiao. I think the foot and leg balm would be great for my dry cracked heels! I learned that the recipes are a century old and passed down through their family! I like that they tell you ingredients to watch for in products for different skin issues. I also like the Ask the Experts section. I learned that it's cruelty free. I'd like to try their healing foot and leg balm.